Local police have offered praise for the team effort in dealing with an arson attack on Craigavon Area Hosptial. An industrial bin was set on fire at the hospital at around 6pm on Wednesday. A 23-year-old male, arrested in connection with has been released on police bail pending further enquiries. Posting on social media, PSNI Craigavon provided information about how the events unfolded and praised the response by fire crews and fellow officers. A PSNI Spokesperson said: “Two nights ago, NIFRS responded to reports of a fire in a loading bay at Craigavon Area Hospital. We were made aware for info only, until we got that all important second call from them. It was deliberate; an arson attack. “Someone had set fire to waste in an industrial sized wheelie bin in an area right beside the Intensive Care Unit (ICU) and the Pharmacy. Has the AMAZING guys and girls at NIFRS not brought this under control and the fire had spread, the consequences don’t bare thinking about. They added: “Yesterday (Thursday) became a very busy day in Lurgan station! Inspector Mills spear headed the investigation and pulled together resources from across units and departments. Whilst yours truly got the glory moment of slapping the handcuffs on a suspect and calling in an arrest, the work put in yesterday by various teams was monumental. 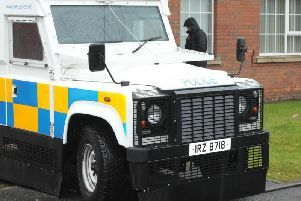 “The initial response and CCTV footage identified and gathered by D section, arrest teams put together from Lurgan Neighbourhood and B Section, statements recorded and CCTV processed by the LPT support team, interviews carried out by Lurgan CID, all with active input from both the Chief and the Superintendent; this was truly a team effort. “The suspect was arrested for arson with intent to endanger life, but this investigation is still at a very early stage. Bail is often necessary to make sure we have all the available evidence to hand, and that is the case this time also. Rest assured though there are bail conditions which we will monitor closely. “If you were in Craigavon Area Hospital and saw anything untoward in the vicinity of the loading bay between ICU and the Pharmacy on Wednesday evening around 6pm, please call us on 101. The incident number is 1100 of 03/01/18.